Just in time for the always enjoyable Holiday shopping season, Nintendo has revealed a set of brand new New Nintendo 3DS options for those looking to pick up some new portable hardware. 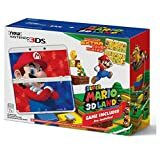 For $99.99, beginning November 25th, Nintendo will offer up a pair of special edition New Nintendo 3DS (non XL version), with no bundled in game, but with a special black or white Mario-themed cover plate. We’re expecting a number of attractive 3DS deals this year, but this is definitely a good starting point. Check out variou retail outlets for the new SKU when November 25th rolls around. See some product shots and packaging below.